Take a peak at some photos, the Kundalini Yoga experiment! Kundalini Yoga, as taught by Yogi Bhajan®, is an ancient science of self-healing and a dynamic, powerful tool for expanding awareness. This system of yoga exercise and meditation promotes physical vitality and health, stimulates and balances the mind, and touches one’s innermost spirit. It is a complete science that combines posture (asana), movement, breathwork (pranayama), chanting (mantra) and meditation into powerful sets called kriyas (sequenced sets of exercises) that target specific benefits. One of the ways Kundalini Yoga is set apart from other yoga is that exercises are very dynamic and active, involving movement with intense breathing patterns creating rhythmic exercise. This opens the body, increasing circulation, flexibility, and energy. Many exercises are designed to give flexibility to the spinal column, which is one of the foundations of physical health. 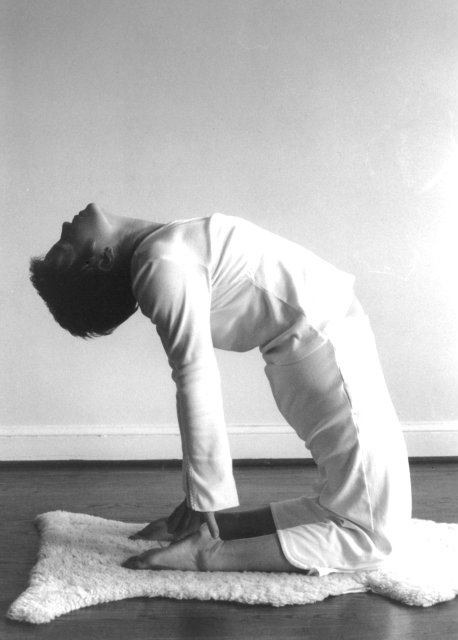 Kundalini Yoga, through increasing body and spine flexibility, develops a youthful body. The practice is an incredible experience in awakening and raising your consciousness, giving fullness of heart, while healing you on a cellular level. It can give you health, happiness and the ability to communicate while building character and stamina. And you don’t have to be an athlete to experience the sublime power of your creative potential being released. keep your body in shape, increase oxygen capacity, boost blood flow, balance the glandular system, strengthen the nervous system, increase natural immunity, have a strong and flexible mind in the face of stress and change, reduce stress-induced toxins such as adrenaline and cortisol, heighten self-awareness and vitality, harness mental and emotional energy, feel more in control of thoughts and feelings, enhance peace of mind, deepen concentration, find inner calm, access intuition and self-confidence, expand awareness, fulfill the soul's yearning for higher consciousness into daily life, and find your highest potential! Classes begin with a time to get grounded, be aware of the breath, and chant the Adi Mantra Ong Namo Guru Dev Namo three times. It means - I bow to the divine light/wisdom within myself and to the divinity of yoga, of the universe. This mantra calms the mind and links us to what is called the Golden Chain of teachers and yogic teachings. Often, it is followed by the Mangalan Charan Mantra Ad guray nameh, jugaad guray nameh, sat guray nameh, siree guru dayv-ay namey. Chanted three times, this acknowledges the primal, true, great unseen wisdom of the ages. It clears any doubt and opens us to guidance and protection. Class typically includes warm-up postures, then a kriya -- a set of postures sequenced in a certain order for a specific reason. For example, there are kriyas for cleansing the liver, clearing depressing thoughts, strengthening the navel center, and balancing the glandular system/metabolism. Usually, eyes are closed, and often you are asked to put hands in a certain mudra (position), to chant (silently or out loud) and to focus within (for example, at the third eye). The practice is dynamic and challenging, but between postures there are pauses to rest in a seated or lying meditative pose. There are thousands of kriyas, so each class is different. Feel free to request certain types of kriyas. A kriya typically has repeated postures practiced with varied breathwork or chanting and may include a short meditation. The kriya is followed by a deep relaxation, lying on the floor on your back in corpse pose (feet about a foot apart and toes to side, hands resting on the floor next to your hips with the palms up). This pose helps regulate the body by letting the blood circulate, balancing the energy, and activating the parasympathetic (calming) part of the nervous system. Often, beautiful yoga chants or the gong is played. The gong is quite loud, so feel the vibrations in the body and allow the sounds to wash over you for a very healing experience. meditation. Usually, class ends with seated meditation practiced for set intervals, like 3 minutes or 11 minutes. Meditation may include breathwork, a mudra (specific hand position), a focal point, chanting and at times movement. With varied things to do at once, this type of meditation helps focus the mind, clearing thoughts and chatter. Class ends with a song and another mantra. The Long Time Sun Song is: May the long time sun shine upon you, All love surround you, And the pure light within you, Guide your way on. It is typically repeated twice, and then the last line is repeated three times. Class ends by chanting a mantra Sat Naam (truth -the reality of one’s existence- is my identity) to awaken the soul and help you get on your right path in life. Sat is chanted seven times longer than nam. The teacher closes with some inspiring words, then the teacher and students in yogic tradition bow together. Bowing brings circulation to the brain and stimulates the process of absorbing what was taught. Also, bringing the head lower than the heart, symbolizes going beyond the mere mental acceptance of the teachings to opening the heart to receiving them fully. Come to class hydrated, but do not eat anything substantial at least two hours beforehand. Wear comfortable, natural clothing and have bare feet. Sit in a different place each class (research shows we learn more when we have a different perspective). Notice how you are before class, during and after. Pay attention to your physical body, but also the clarity of your mind and your spirit. Be willing to feel whatever emerges for you, as Kundalini Yoga is challenging, and as you open your awareness, it can be even more challenging. Working through mind over matter (the little voice in your head saying you can not do it) empowers you and many benefits will emerge. Commit to a regular practice. why don't you offer free trial classes? Yoga involves an exhange of energy. If you come with nothing invested, you will get little or nothing from your experience. (Or, from past experience, people don't come even after reserving their space!) In Kundalini Yoga, we call this IItarashtam tithar Kashtam - "Empty handed you come, empty handed you go. It's a law which should never be broken." -Yogi Bhajan. That is why we do not offer free classes. what is the history of kundalini yoga? Yogi Bhajan, Master of Kundalini Yoga, arrived in the US in 1969 with a stated purpose: “I have come to create Teachers, not to gather disciples.” For over 30 years, he traveled internationally teaching Kundalini Yoga, the Yoga of Awareness. In 1969, he founded 3HO-Happy, Healthy, Holy Organization, based on his first principle “Happiness is your birthright.” Through The Aquarian Teacher Program, Yogi Bhajan has trained thousands of Kundalini Research Institute (KRI) Certified Kundalini Yoga Teachers. In 1994, the International Kundalini Yoga Teachers Association (IKYTA) was formed to further spread these priceless teachings through the united efforts of Kundalini Yoga teachers worldwide.